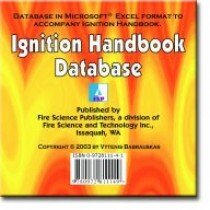 Ignition Handbook Database Download – Fire Science and Technology Inc. This zipped downloadable file contains much of the tabular material contained in the Ignition Handbook. Data tables are provided in the form of Microsoft Excel spreadsheets. Available for purchase separately is the Ignition Handbook Database. For convenience of users, much of the tabular material contained in Chapter 15 of the Handbook is made available as a downloadable file. Data tables are provided in the form of Microsoft® Excel spreadsheets. This allows easy access to information and also permits users who wish to seek to discover new data correlations to do this conveniently. Users must have Microsoft® Excel 97, or later version (or else a compatible spreadsheet program). The database tables provide information on 473 pure chemical compounds and over 500 commercial or natural products, including such substances as dusts, fuels, lubricants, plastics, and woods.